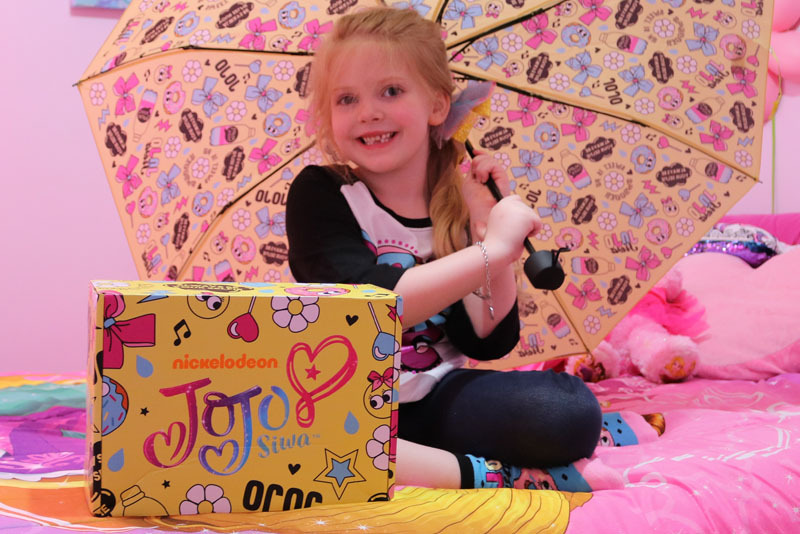 The JoJo Siwa box is the perfcect subscription box for all the little JoJo Siwa fans! Check out what is inside the box here! If you follow me on this blog or Instagram, you have probably noticed that Abigail loves to wear bows. 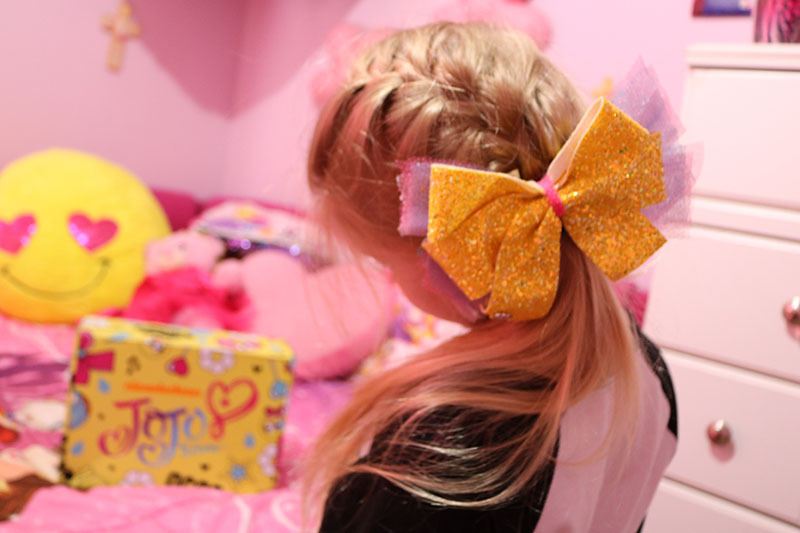 In particular, she loves JoJo bows! Not only does she love JoJo bows, but she loves her music as well. So when I saw the JoJo Siwa box, I knew I had to surprise Abigail with this one! If you don’t know who JoJo Siwa is, she is what I would consider a great role model for young girls. She shares a message of overcoming the haters (aka, people who doubt you or criticize you) and following your passion. We first discovered JoJo Siwa on dance moms and have been following (and cheering) for her success since. What is the JoJo Siwa Box? 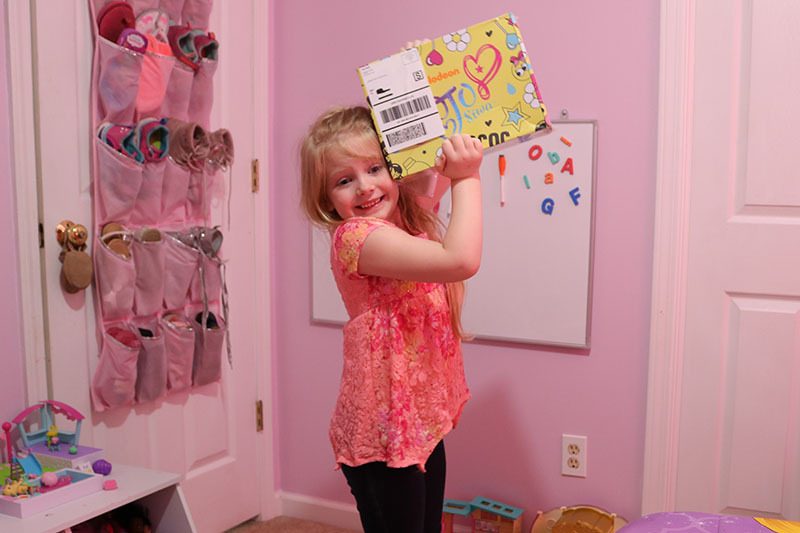 The JoJo Siwa box is a box you receive in the mail quarterly. For only $30 a month, you get a $60 value of merchandise. 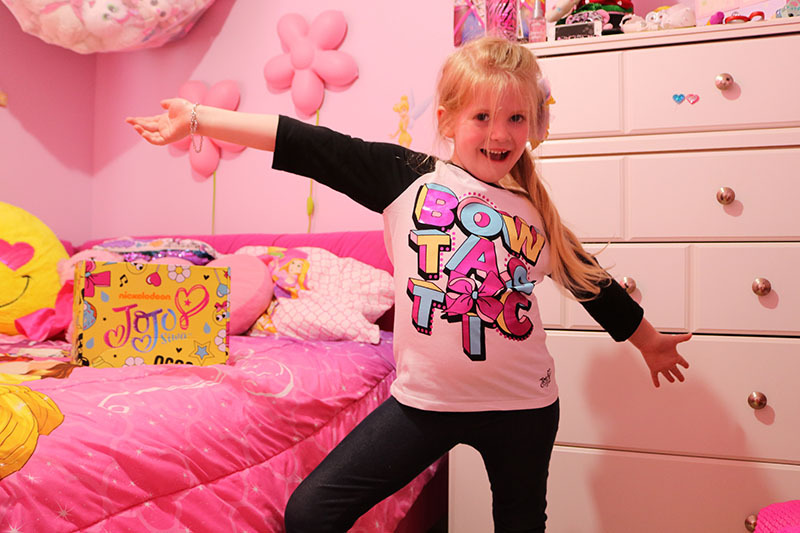 You can order the JoJo Siwa box here. 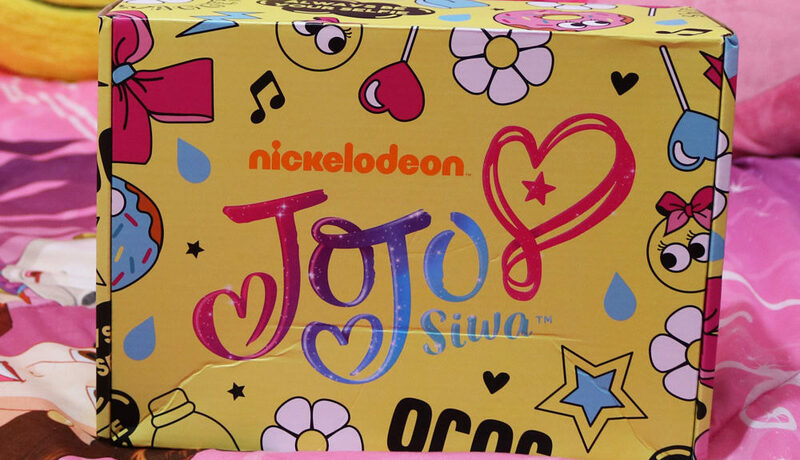 What’s Inside the JoJo Siwa box? Inside each box, you will get an original bow which is different than the styles you can get in the stores. I love the different layers and materials of the bow Abigail received in the spring box! I also love that it is still oversized like the rest of the JoJo bows! Super cute! Abigail is super excited about the bow as well! You will also receive a different charm for your charm bracelet in each box. 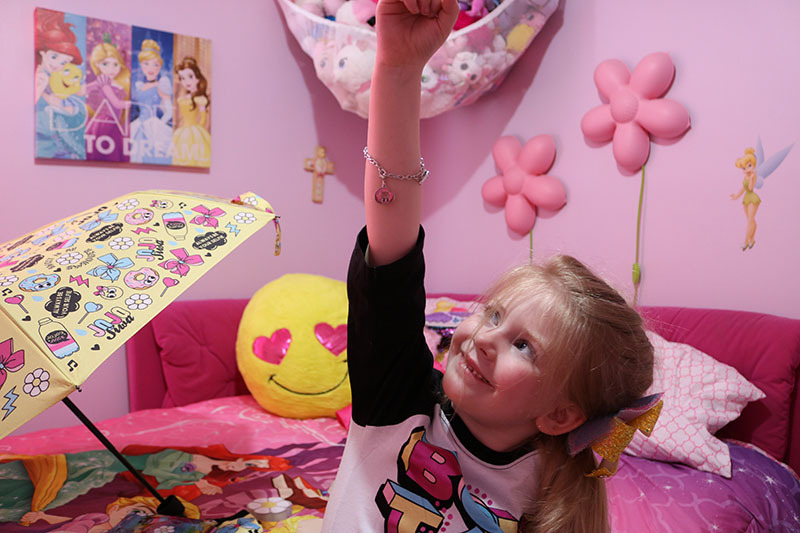 If you ordered the first JoJo Siwa box, you received your charm bracelet in this box. If not, you can add it to your first shipment. For the spring box, Abigail got a donut charm! She is really excited about adding more charms to her bracelet. The rest of the items in the box will vary each shipment. 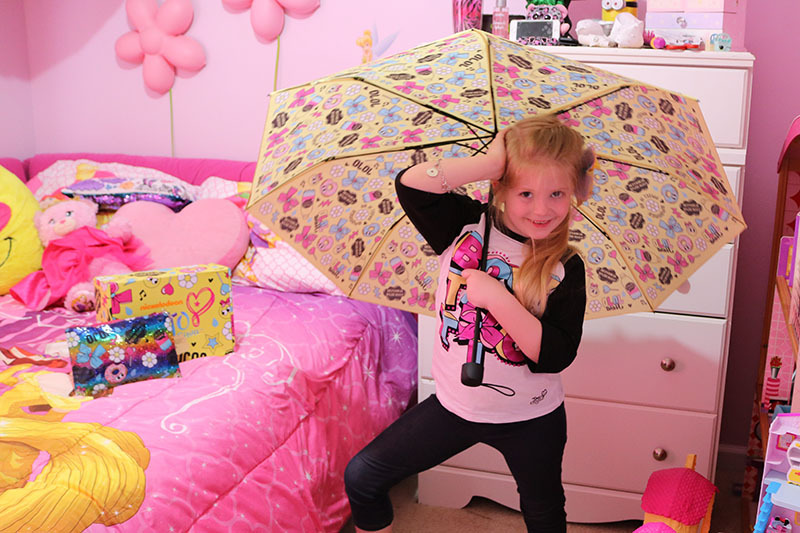 Included in the spring box was also an umbrella! If you can’t tell, Abigail loves to pose and take pictures! She was having a blast show casing all of these items! This BowTastic shirt Abigail is wearing, was also included in the box. Now we just need a shirt that says KatTastic for Olivia’s YouTube channel! The unboxing video of this box is also included on KatTastic and is at the bottom of this post. The last few items in the box are: 3 pairs of socks, a daisy shaped notepad and a pencil bag. This was a really fun subscription box for Abigail to receive in the mail. 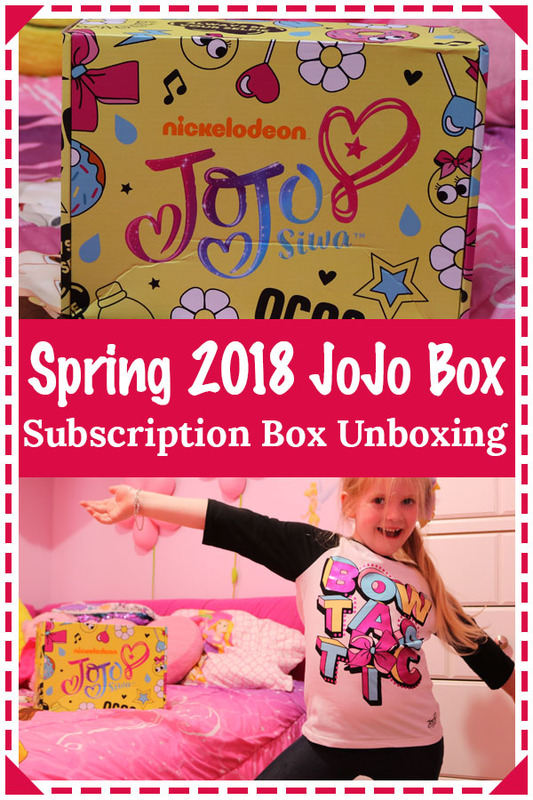 If you have a JoJo Siwa fan in the family, then I hope this unboxing was helpful for you if you are considering ordering the JoJo Siwa box. If you love reading subscription box reviews, we have a whole library for your to search through! 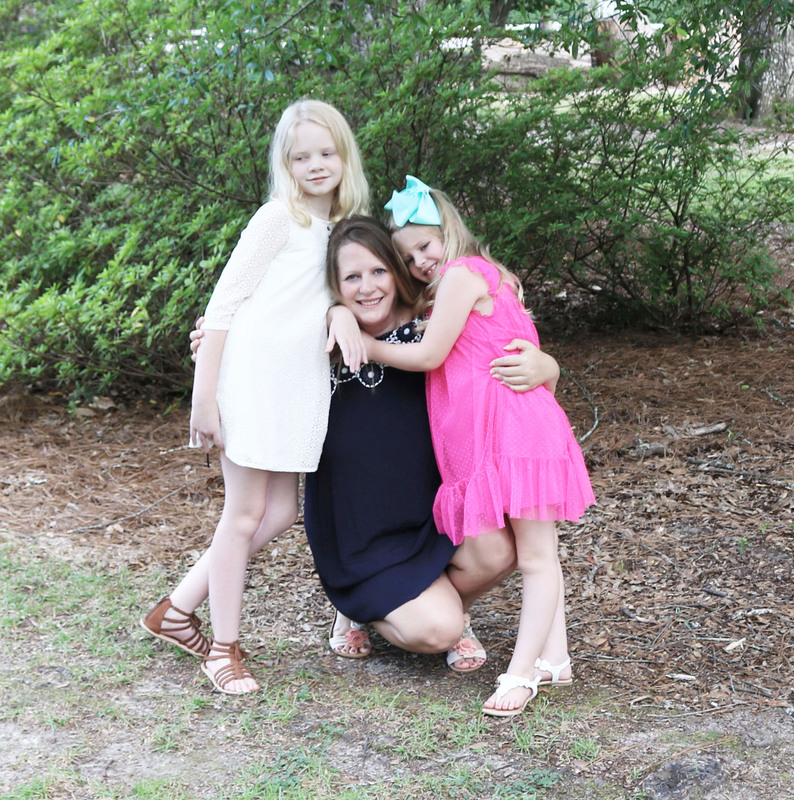 If you are your daughter are a Siwanator, share the love by pinning this post! What a fun box! I have to check this out. My girls would love this! This subscription box is so cute. It’s perfect for a birthday gift. This was fun to read as I know exactly who JoJo is and I love big bows on my 2 year old! Big bows are the best! One of my girls loves the cat ears and the other big bows. Love their personalities! I’m loving how many subscription boxes there are now. This sounds like such a fun box to look forward to! OMG WHAT AN EXCITING BOX for a little lady to get!!! I need to look into this, now that my daughter is older… She is starting to get more and more into girly things, like dresses and hair bows and other cute little girl things. Show her the music videos of JoJo on YouTube! It’s such fun music for kids! Recently I bought a similar big bow for niece and I think bow looks really cute and adorable for young girls. I like the jojo box which include so many fun stuff! I love the youtube and both girls look so natural. Very cute! I didn’t know that Nickelodeon had a subscription box. The big bow is too fun and I love all the other bow-themed goodies included in the box. This would be absolutely perfect for my niece! Abigail’s doing a brilliant job of showing off the items! I’m surprised, actually,that you get so much in one box, it looks pretty good value for money. Aww this looks like such a super fun and cute subscription! It’s so adorable! My step daughter would love this box. She loves all things girly. I’ll definitely be looking into this for her! 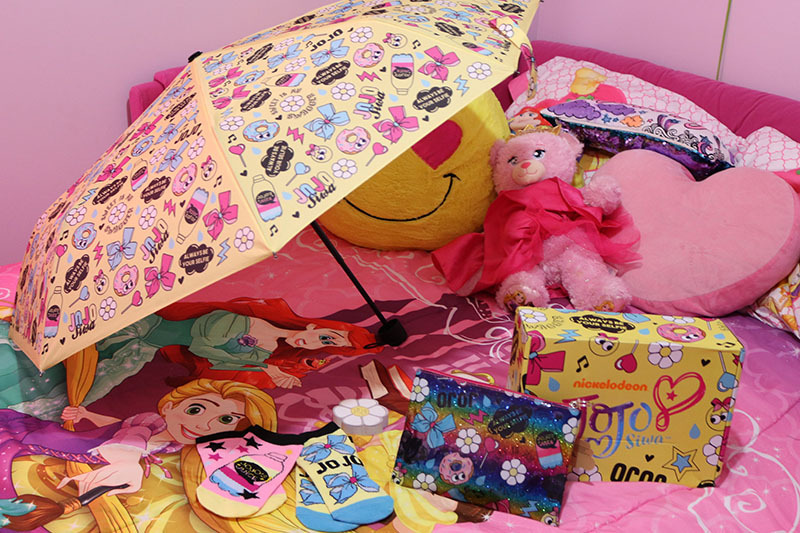 Every time the subscription box arrives, it must be like Christmas with a new collection of girly gifts. 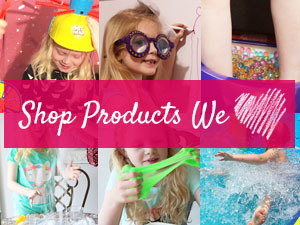 This subscription box would make a fabulous gift for anyone’s daughter. I’d love to see my daughters’ reactions each time the box arrived. Lovely! She seems like enjoying everything in it. I haven’t heard of Jojo Siwa box. Though I may need to check for my nieces. Thanks for sharing. 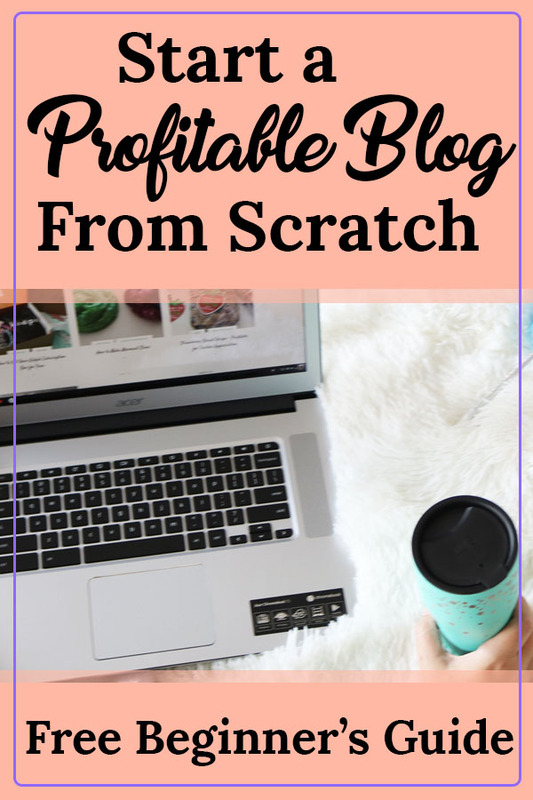 What brilliant pictures… You have the perfect little blogging model there!! very cute indeed and the box looks like great fun. Great idea and your daughter is so cute! If only they had boxes like this when I was young! I don’t have a daughter and never heard of Jojo Siwa. My little niece would love this box though! Cute stuff! This is great for surprises. 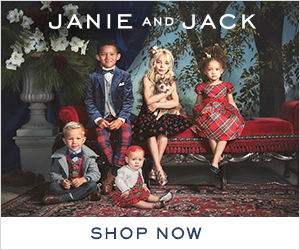 I hope there is also a subscription box for boys. I would be happy to receive one myself. My daughter would absolutely LOVE this box! She’s a big jojo fan – those bows! What a lovely box for kids! I love everything inside. That is so adorable. I no longer have young girls at home but a niece would absolutely love this as a gift. Excellent box. Oh man, I have only boys so this wouldn’t go far in my house. What I wouldn’t give to be a little girl in today’s age! How cute is this?! My daughter and her friends love JoJo. She looks so cute in her bow! Definitely a mini JoJo in the making! Going to order one of these for my little sister! What an awesome box! So many neat surprises. 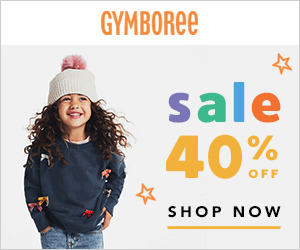 This is a great gift and the bows are adorable. Your daughter is so cute and with a lot of personality. Thanks for sharing her with us! omg how awesome is this- i think my little one would love it as well 🙂 Thanks for sharing! It’s so cool that there are more subscription boxes for kids nowadays. Back in the day, you can count them. There there’s so many. Cool. Amazing, no idea she had this. My 11 year old is a massive fan and has so many of her bows. I wonder if it’s just for the US or the UK as well.